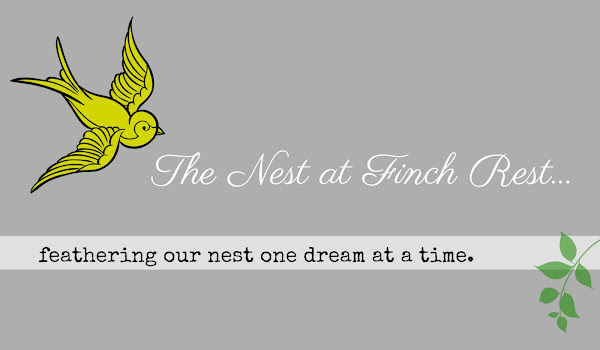 The Nest at Finch Rest: Happy St. Patrick's Day! Wishing you all a safe & fun day! 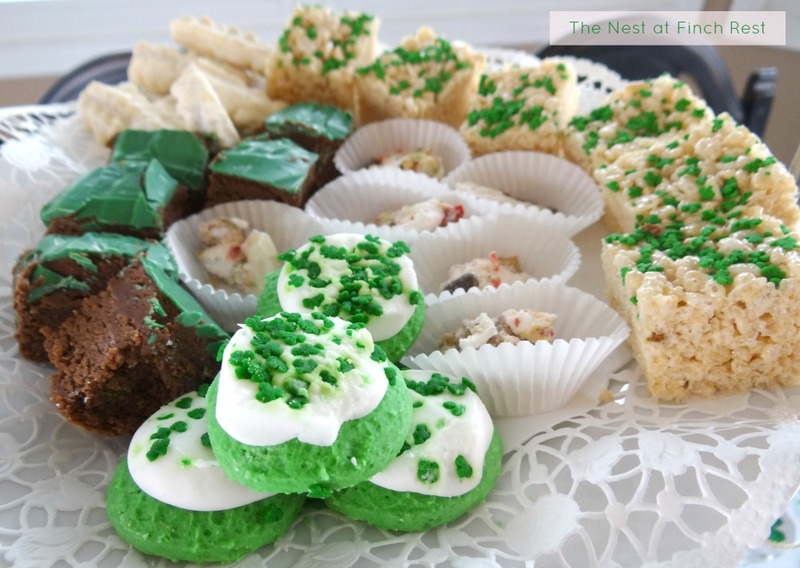 I'm not able to host my St. Pat's tea party this year. or any cards made or any even sent out this year. I am really missing my dad today. and all my siblings years ago. See the deep green piece of Connemara marble in the heart? I am so sorry to have to be away from you all. 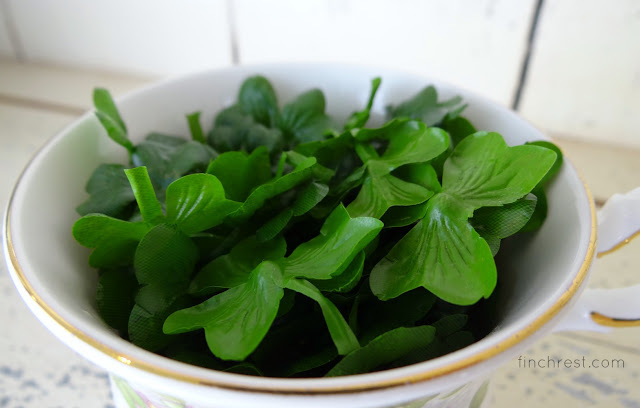 I miss spending time in blogland. there's a lot going on right now with health, jobs and stresses. Just to let you know, though, that I am FINE. But shall be back soon to help celebrate springtime with you! See you all very soon, I promise! Blessings to you Michele! I think of my mom and our Irish roots on this day too. Sounds like it is a challenging time for you and your family right now. Best wishes and thoughts your way. You will be thrilled when all the painting is done! 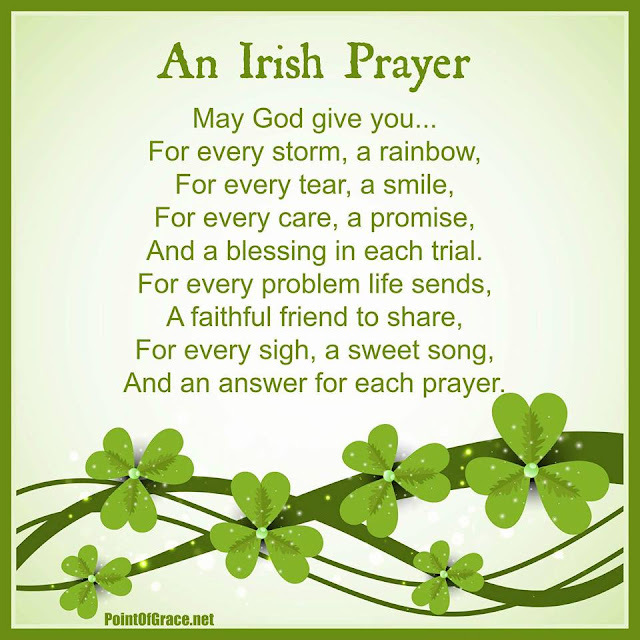 Sending that beautiful Irish Prayer right back to you! Happy St. Paddys day to you. 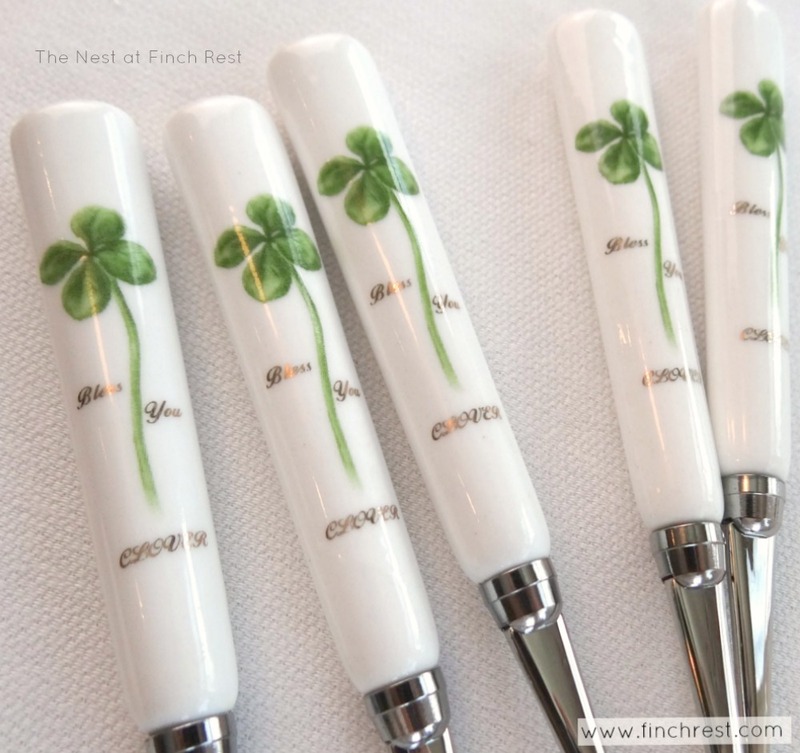 Love the shamrock silverware, so pretty. I know what its like to have your house a mess with painting, so just relax and it will pass and well worth the trouble. Happy St. Patrick's Day, Michele. It's hard to be away from anyone or anywhere you want to be and can't. I hope you can just relax into what is going on there at your home. It will have a huge payoff, I'm sure. Happy St. Patrick's Day, Michele! Home improvement projects always seem to draaaaggggg on forever, but the outcomes are well worth the wait! I'll remember your family in my prayers. Happy St. Patrick's Day to you, Michele! ☘ The Irish prayer that your dear MiL sent is a special one. I will copy that for sure. I hope your house gets back to normal soon and I will remember your family in my prayers. Happy St.Patrick's Day to you as well. All of your tea pretties are perfect for this holiday. Lovely prayer from your mother-in-law. Going through home makeovers isn't everyone's favorite thing to do, but well worth it after all is said and done. We will be here when you return, just enjoy what you are in the midst of. 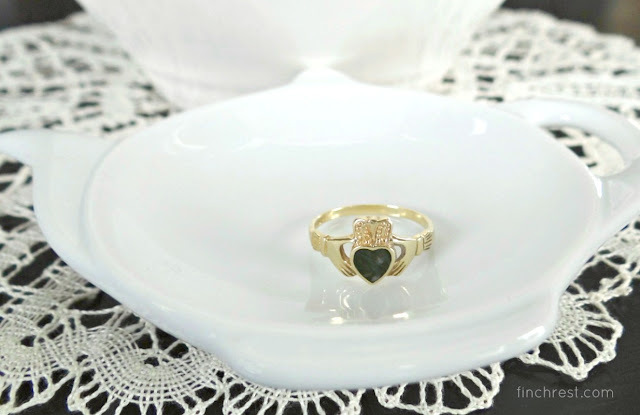 Oh such lovely dishes - and the ring is precious. 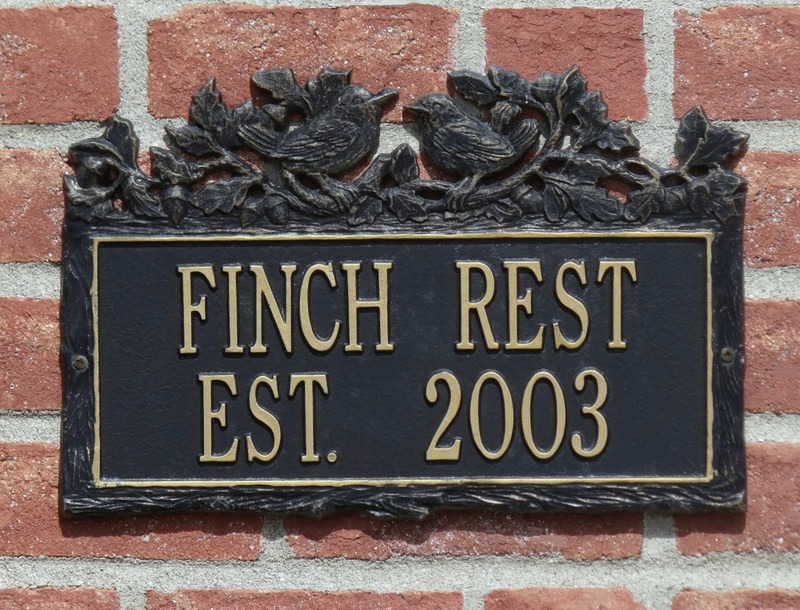 Take all the time you need - we'll be remembering you and looking forward to having you back with us regularly. Such a sweet post, Michele and I know this is a day which you miss your dear father even more. Your Claddaugh ring is beyond beautiful. How nice that it came from The Emerald Island itself. I gifted both my daughters with these rings but with their birthstones. Thank you for the wonderful Irish poem. They are very wise! Saying a little prayer for you and family. The house under plastic would be enough stress. What a special gift from your dad. Thank you for showing your Irish treasures; they are truly lovely. Take care of yourself...see you soon. Such pretty photos Michele. I know how you feel, we just finished a project last year and plastic over everything. Just remember how happy you will be when it is all finished. Oh my goodness, what a special gift, a beautiful ring. The prayer is indeed special from your MIL. I do hope all is better soon for your family. Take care Michele………..Sending you Irish blessings. Oh Michele, thinking of you and your family. Sending prayers. 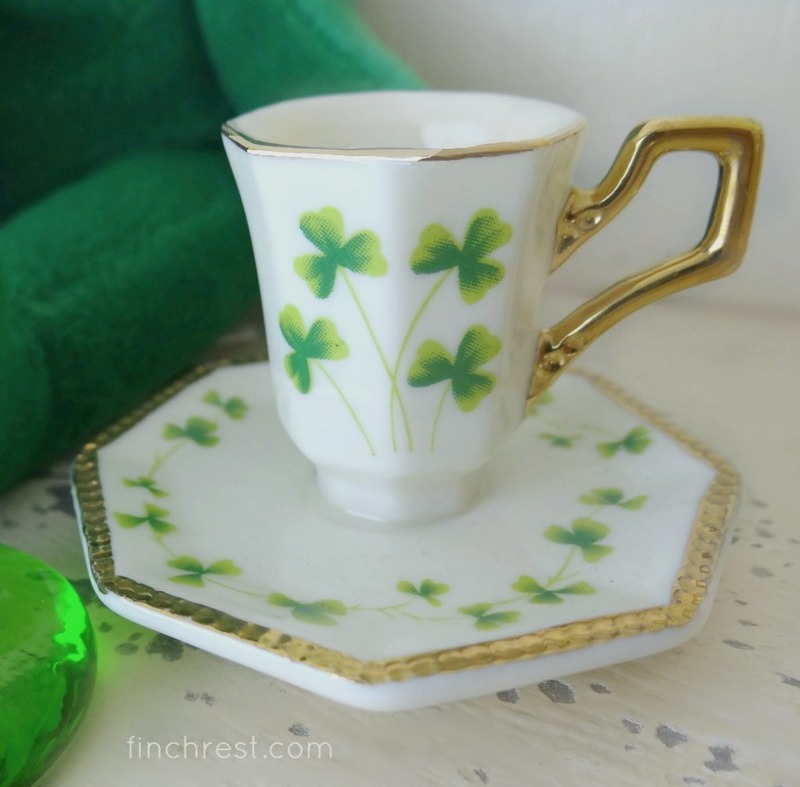 Beautiful Irish pieces you have shared. Beautiful post ,Michele. Blessings on your work. It will be worth the wait. 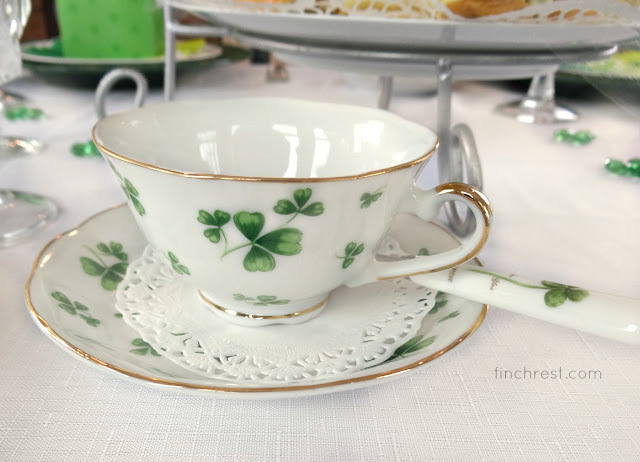 A belated Happy St. Patrick's day Michele, enjoyed seeing past festive tables. 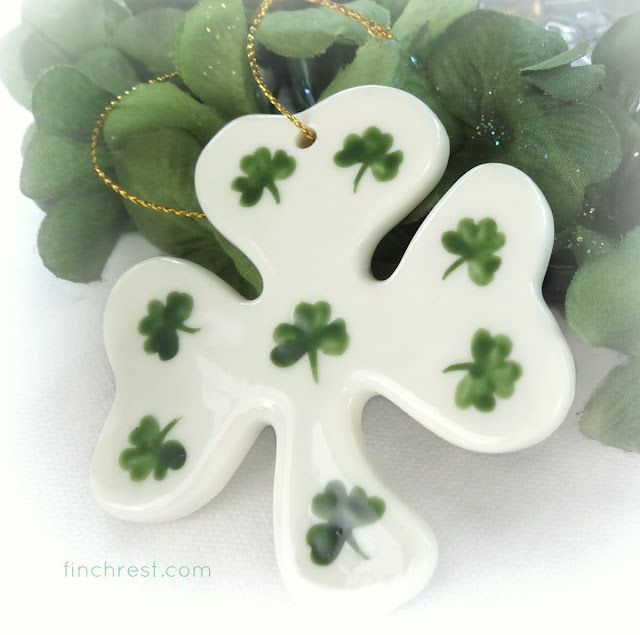 The shamrock pendant I bought in Ireland has Connamera marble for the green leaves. Hope the painting is done before Easter. Happy painting, dear Michele :) Much love to you! Happy belated St. Patty's Day wishes! Miss you, my friend! Having the whole inside of a house painted is as much work as moving, I think! !